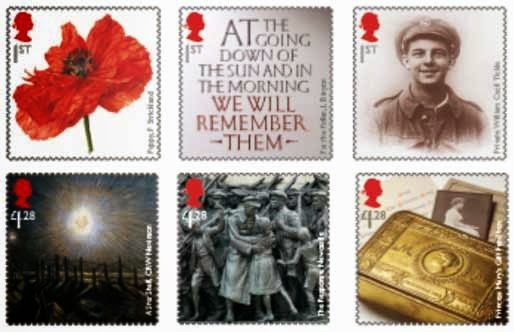 Royal Mail will issue a landmark series of Special Stamps each year from 2014 to 2018 to commemorate the Great War. The set will feature 30 stamps, with six being produced each year. The first set of stamps will be issued in July this year. - The contribution of the Commonwealth"
The stamp issue consists of a set of 6 stamps and a prestige stamp book containing the six stamps and two definitive panes. The usual stamp cards, first day covers and presentation pack will also be issued, along with a Coin Cover. More details will be on our website later. See the full Press Release here. Full details, including ultra-violet pictures, on our website. Looks like it will be a fascinating series. I presume that there will be a Prestige Stamp Book issued for all five of the years featured? I stopped collecting commemoratives in 2011 but these are a 'must have'! A beautiful and poignant set of stamps to commemorate a most ugly event. Actually I expected something different, like famous battles, or ammunition, famous tanks, aircaft, warships used during those years.